This post was originally published on April 10, 2017 but updated on April 8, 2018 to reflect new ticket prices for the 2018 season as well as updated offers. The Boston Duck Tours can be fun experience for kids, Boston tourists, and more! The Duck Boat tour is 80-minutes in length and depart from the Prudential Center, The New England Aquarium, and the Museum of Science. However, sometimes you can get better deals if you leave from one location over another. (There’s usually less deals and specials from the New England Aquarium location, for example). 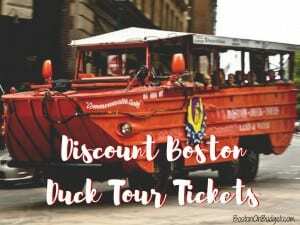 Tickets for the Boston Duck Tours are $41.99 for adults, $33.99 for adults 62+ and military members, $27.99 for children ages 3-11, and $10.50 for children under 3, including newborns. Ticket prices do no include the 5% Convention Center Fee and online orders are subject to a $2 per ticket fee and phone orders are subject to a $3.50 per person ticket fee. *Some links may be affiliate links and I receive a small thank you for purchasing through my link, so thank you! Early Duck Discount: Save up to $9.50 per ticket with Early Duck Discount by booking a 9AM or 9:30AM Tour from the MoS or Prudential Center. Early Bird tickets are $32.99 per adult, $29.99 for seniors/military, $25.99 for children 3-11, and still $10.50 for babies for online and phone orders only + ticket fees. Family 4-Pack: Families can get 4 tickets for $125, which includes 2 adult tickets and 2 children ages 3-11 tickets from the Museum of Science Location, not available on Saturdays, ticket booth or phone reservations only. Group Rates: Groups of 20 or more can receive special group pricing, up to $10.50 off tickets for groups of 20 or more, or rent a whole duck boat for a group, service and gratuity fees extra. Go Boston Card: Free tickets to the Boston Duck Tour for Go Boston Cardholders available in select packages/choices when you buy the discount attraction card. 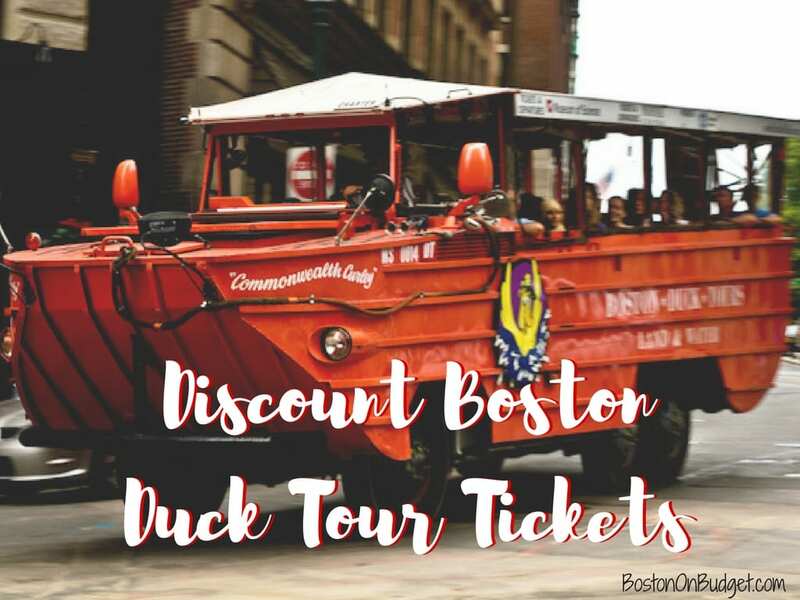 Viator: Boston Duck Boat tickets are full price ($44.53) but new Viator customers can save 10% on their first purchases when you submit your e-mail address (you should receive a pop up with the current offer) or new customers could sign up through a referral link for a free $10 credit to apply to your purchase. LivingSocial and Groupon previously had daily deals for Boston Duck Tour tickets with LivingSocial being the likely bet, but I haven’t seen any offers in over a year or more, and have seen more promotions for locals than I have in the past, so they may stopped promoting through the sites altogether. However, it’s worth keeping an eye on the daily deal sites, just in case. Let me know if I missed any great deals or discounts for the Boston Duck Tours in the comments below! Have you taken a Boston Duck Tour before? Will you be going on a duck boat soon?